The first time I ever logged onto the World Wed Web, I (naturally) began with a search for “ceramics.” What would I find as I waited for my 15 baud/sec. dial-up connection to complete? Way back then, web navigation was still mostly a series of lists, of links. Unless you knew exactly what you wanted (who did? ), you scrolled through pages of options before getting to an actual page of information. After following a few random links, I found myself on the website of the U.S. Air Force and their use of high-tech ceramic fibers. Welcome to the web! At no time more so than today, technology affects the way we interact with, and understand the universe. Among the many uses of hi-tech ceramics has been our ability to leave the confines of planet Earth. We’ve even sent probes into interstellar space. They will continue to exist eons after Earth has disappeared during the sun’s burn-out progression into a red giant star. 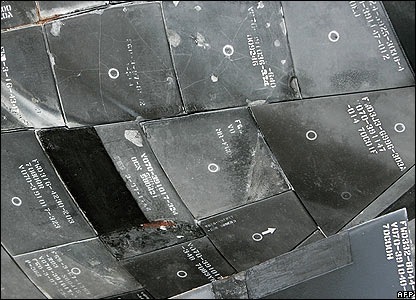 Heat shield tiles on multiple-entry vehicles like the Space Shuttle appeal to me most out of all the hi-tech ceramic applications. Without these tiles, human beings could go beyond, but never return. And without the shuttle program we wouldn’t have the Hubble Space Telescope, countless other satellites, and (in part) the International Space Station. The blocks of reinforced carbon and LI 900 Silica that are attached to re-usable space craft by (essentially) Velcro are what allow space travelers to tell the rest of us about the view from above. Granted, such ‘ceramic’ applications as heat shield tiles bear no practical resemblance to the earthen material we make pots with. But the fundamental building blocks of our messy clay bodies play an essential role in efforts to unlock the universe’s mysteries. When we work with clay, we take part in a story that stretches from simple expressions of utility to mind-boggling explorations of the limitless expanse that surround us. That’s an encouraging thought for any potter who feels as though their slogging efforts at keeping the shop going are slowly turning their hair gray. You are currently browsing the archives for the Hi-tech ceramics category.